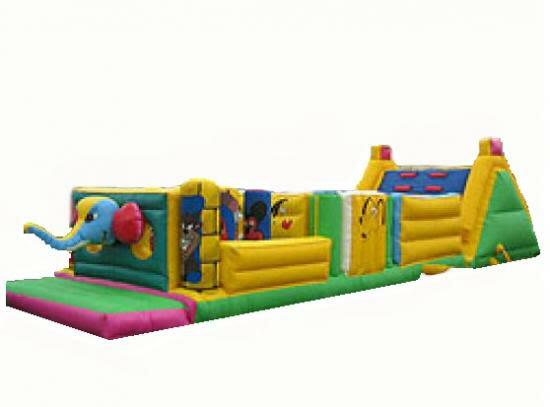 inflatable bouncy castle slide hire. 50ftx10ft elephant assault course is multicoloured and is great fun.And has loads of obstacles to get over and go through and it has one big slides on it which is at the end which the kids love. It also has a big elephant head at the start of it as you can see from the picture.All are assault course are two see who can get down them from the start to the finish the quickest.The kids love them so why not book on line today and get one for your party our your event.We hirer all our bouncy castles,inflatable slides,and our rodeo bull hire in and round the liverpool area plus the surrounding areas which include widnes,warrington,runcorn,st helens,and the wirral,plus other areas which you can call us to see if we will cover.There might be a fuel charge for some areas we go to and will go to.But you can check this on are website by clicking on are postcode checker and it will tell you if there is a charge for your area.